RingByName subscribers can send and receive text messages via the RingByName web application. For instructions on how to send text messages via the mobile application, please visit the knowledge base article located here. How do I add SMS Texting Service to my RingByName Account? How can I send an SMS Text message? How are SMS Text Messages stored in RingByName? How can I access old my SMS Text Message history? What does SMS Text Messaging Cost? How many texts can I send? Does RingByName offer Toll-Free SMS Text Messaging numbers? Does RingByName offer International SMS Text Messaging numbers? Why don't I receive pictures that have been sent to my SMS number? How do I send pictures via text message? Will I receive notifications when a new text message is received? Can I assign the text message conversation to a team member? How can I change ownership of a text message conversation? How do I grant my team members access to use SMS? Check with your system adminsitrator to make sure that SMS is enabled and active on your account, and that you have been granted access to access SMS service. If you are the account owner, you can add SMS Text Message service to your account by contacting the Customer Service Department by calling 855-345-7464 or by emailing us at service@ringbyname.com. Open an existing contact and click on the SMS icon located below the note entry area (inside the white box area). Enter a message in the section labelled "Write an SMS..."
Select the telephone number you would like to send the SMS message to in the "To" drop-down. Click on the create new message icon . Enter a number in the search field. If it is found on an existing record it will be displayed. If it is a new number, a clickable link will appear for the number. Click on it to begin a new SMS message. 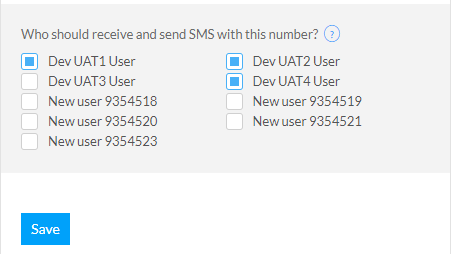 Select an available SMS number on your account from the drop down box. Compose your message and click the send button. SMS messages are attached to your contact cards and automatically stored in your RingByName account just like fax records and notes. Your SMS history is permanently stored in your logs and will be accessible even if you deactivate SMS service on your account. SMS messages can be accessed by clicking on the SMS navigation icon located at the top of the RingByName application and searching for a conversation by a contacts name or their mobile number. 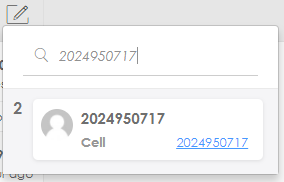 Alternately, you can open the contact card in your company address book and view the SMS message history by clicking on the SMS history icon at the bottom of the screen. All SMS messages sent and received will be located in the history if they have been received at a number associated with that contact. There is no cost to add SMS Text Messaging to an existing company number on your account. You can send and receive unlimited SMS messages within the US, Canada and Puerto Rico. If you would like to add additional SMS number on your account, simply purchase an add-on company for your business and we'll set it up to receive SMS messages. To add an additional Company Number or activate SMS, contact Customer Service at 855-345-7464 or email us at service@ringbyname.com. Does RingByName offer Toll Free SMS Text Messaging numbers? RingByName does not offer text messaging via Toll Free Numbers at this time. RingByName does not offer International SMS numbers at this time. RingByName Business SMS does not currently support picture messaging (MMS). This is a planned upgrade. If you are interested in having us let you know when MMS is available, send us an email at sales@ringbyname.com and we will contact you once it becomes available. You will receive notifications for any new text messages for any new SMS-enabled telephone numbers to which your administrator has granted you access. You will also receive notifications for any SMS conversations that you have been assigned as owner. A new message notification icon will appear in the navigation area at the top of the web application showing you a count of new unread text messages. Any new SMS messages will have a green dot next to the unread message(s). Click on a conversation you would like to assign from the listing of SMS conversations. 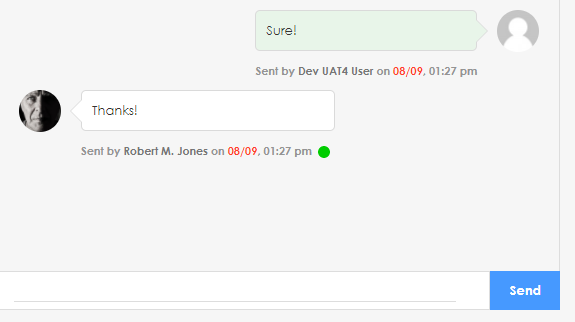 Click on the Unassigned icon and select a user to designate as the conversation owner. The conversation owner will be the only individual that will receive notifications of new messages, however, any user that has been granted access to the SMS feature can read and reply to an SMS. Once an SMS conversation has been assigned, only the current "owner" can assign it to another team member. To reassign the conversation, follow the instructions here. Click on your name in the top right corner and click on your name, then click on "System administration" from the drop down menu. If it does not appear, then you do not have administrator permissions to your system. Click on "RingByName Setup" from the navigation bar at the top of the screen. Click on the "Phone Numbers" icon located on the left side of the screen. 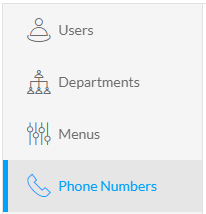 Locate and click on one of the locate your SMS-enabled number from the list of your company numbers. Scroll to the bottom of the phone number settings located in the last column. Click on all users that should be granted access to receive or send SMS messages, and click "Save". Speed Test - Is your Internet Connection Fast Enough For RingByName? Our cloud based business is the best there is! Send faxes straight from your phone! Greet your customers by name! 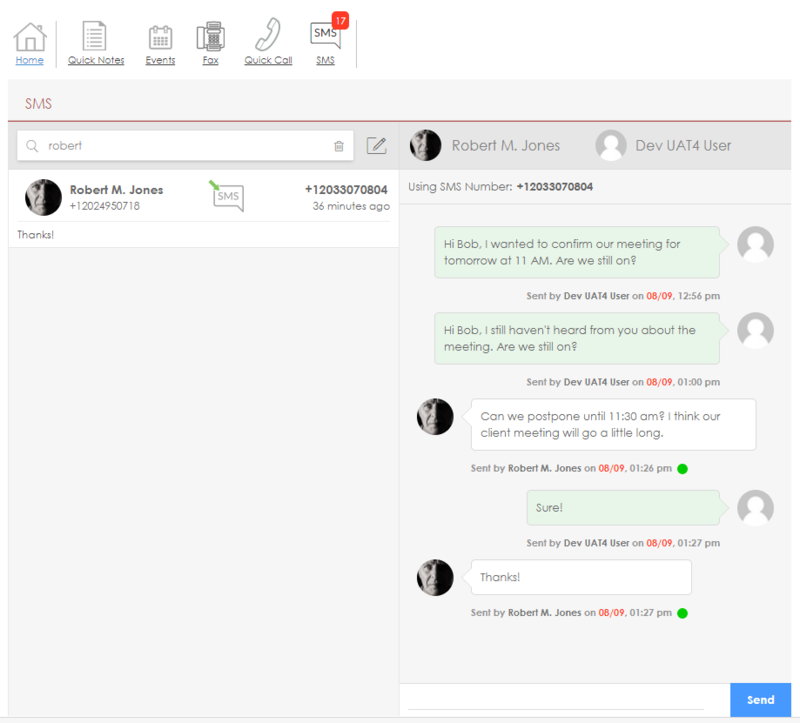 Launch a call from within a web browser using the Click2Call Extension! Change and Customize your Caller ID! Adding notes to a contact from your phone!